Join today, and become a member of a fun club united by a love of Math. 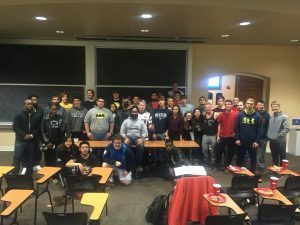 Whether listening to a presentation about the next big thing in Math, participating in club math competitions, or enjoying pizza with your fellow math enthusiasts, weekly meetings are a fun time with little extra commitment onto already busy schedules. Be sure to come out this week, and invite all of your friends to enjoy free pizza during our meeting. Just to remind you, Math Club meets on Mondays at 6:00pm in 114 McAllister Building. Hope to see you all there!